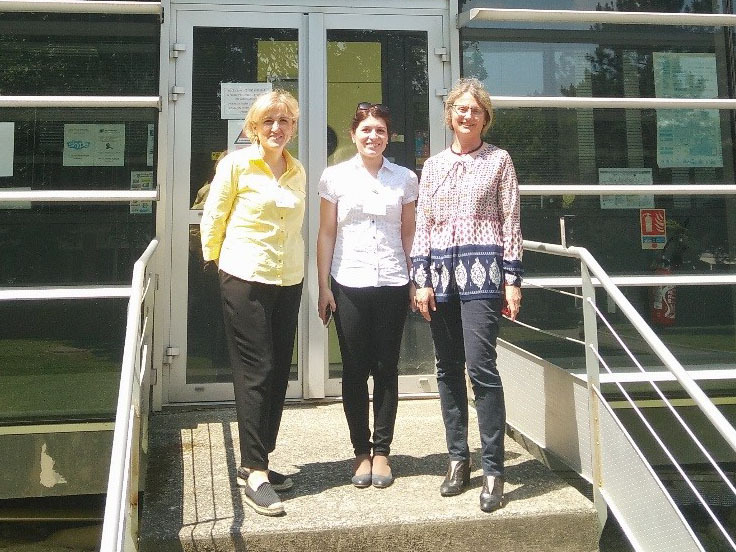 Professor Nona Janikashvili, Professor in Immunology, and Dr Khatuna Lomauri, Neonatologist, from the Tbilisi State Medical University (Georgia) [http://new.tsmu.edu/home] visited us on the 24th of May, 2018. While already developing privileged relationships with the “Centre for Pathophysiology of Toulouse Purpan” (CPTP), the Georgian researchers discovered more deeply the training and research activities of the University Toulouse III-Paul Sabatier, with the goal of exploring new opportunities of cooperation. Dr Isabelle Saves, Head of International cooperation at IPBS and CBI-Toulouse, presented the research activities of the CBI and IPBS to our Georgian guests. A visit of the IPBS facilities and discussions with researchers, Drs GeanCarlo Lugo, Christel Verollet and Celine Cougoule, allowed to identify common interests that will be pursued by further discussion and a sharing skill mobility programme between TSMU and the University of Toulouse; attention will be given to opportunities of co-tutelle and joint PhD, joint research projects and students exchange programs.